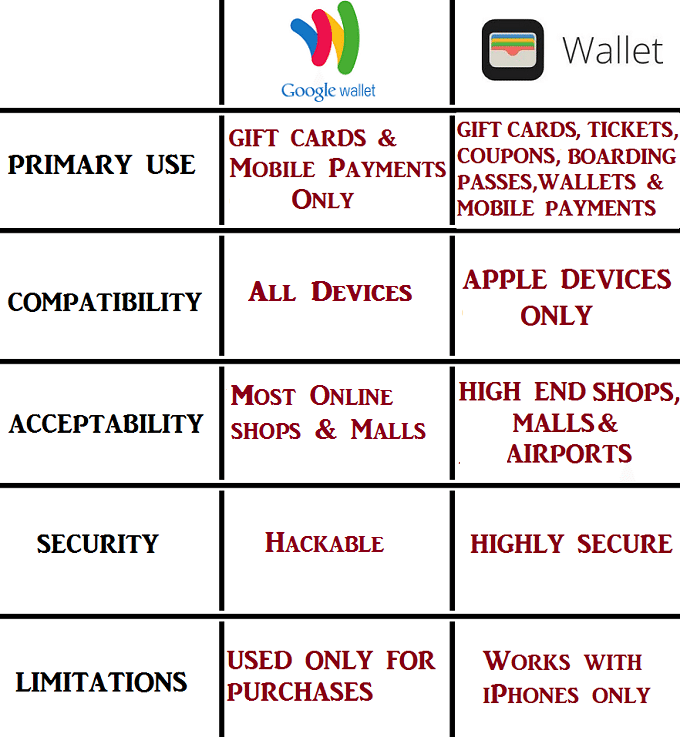 Google Wallet vs Apple Wallet, What's Your Pick? Online Music Store Google Wallet vs Apple Wallet, What’s Your Pick? Google Wallet and Apple Wallet are two digital wallets that are on the competitive edge of mobile payments today. Google was one of the first companies to launch the mobile payments while Apple is one the last. This being said, there is no way the two can be equal since one of them has enjoyed time in the market more than the other, and the other one has been released with newer features and on a different platform. Google Wallet was one of the mobile payment methods that made the general public aware that it is possible to pay for what you want with your phone. When the iPhone 6 and 6 Plus was launched the same time Apple Pay debuted, many people that the digital wallet world will be dominated and that Google wallet is dead but that did not happen. The most significant difference between the two mobile payment methods is the platforms they are supported on. Google Wallet is supported on all Android devices while Apple Pay is only supported by the iPhone series specifically iPhone 6 and later. It is also available on other Apple devices with iOS. The significant difference here is that Google Wallet is compatible with both Android phones and the Apple devices as well. This means if you have an iPhone, you can use both the Apple Wallet and Google Wallet on your phone. On the other hand, if you have an Android smartphone, it is impossible to use both the services since Apple Wallet is strictly limited to being used on Apple devices. Both Apple Pay and Google wallet use Near Field Communication NFC technology, which is more of smart chips and waving rather than magnetic strips and swiping. Google Wallet has done it’s best to make sure your purse is digitized,but Apple is doing a much better job. Google wallet initially used a secure element for their transactions,but they later found themselves locked out by carriers like Verizon. Google then stopped using the secure element in 2014,but instead, they started using host card emulation. Google Wallet uses a PIN to authorize transactions and the app can be remotely disabled from Google Wallet’s website. Apple Pay, on the other hand, incorporates a secure hardware element,but instead of a PIN code to authorize transactions, Apple uses the Touch ID which reads your fingerprint to approve transactions. To encrypt your data, Apple Pay creates a one-time transaction code for security purposes. For enhanced security, Apple does not store any of your transaction information and it doesn’t track your purchases the merchant also doesn’t see or have access to any of your financial information. If by chance you lose your phone, all Apple Pay transactions can be disabled using the Find My iPhone app without canceling the credit cards on your phone. This makes Apple seem superior when it comes to security and convenience as well. You don’t have to open your app, enter a pin or navigate to a coupon or card to make a transaction. iPhone users don’t have to wake the phone’s display,but they just hold the phone near a contactless reader. Apart from being convenient, it is easier to commit fraud if you know someone’s secure PIN than when they use their fingerprint to authorize transactions. Google is trying so hard to replicate the real wallet in the virtual world. It is doing this so much that using Google Wallet; it tracks all your transactions, saves order details, making it seem like you stuffed your receipt into the wallet. The data collected is used by Google to serve ads that matter to you and this feeds directly into Google’s business model. Upon it’s launch, Apple declared explicitly that it doesn’t and will never track your track your transactions. Apple doesn’t even store your card details on your device or their servers. The only thing Apple does is transmitting your card to the bank and authenticating it then receives and stores the DAN that the bank will send back. Apple is a payment medium and not a payment intermediary and it sticks to that. However, if someone gets access to your Apple Pay phone and somehow your fingerprint, you will have to take that up with the bank and not Apple. The consumer becomes the ultimate winner with these two mobile payment methods, because they just have to choose the most convenient for them. The two have their strengths with Google Wallet having its strength lie in its support for loyalty cards. And the ability to send and receive money just like PayPal does and also its ability to work with any bank or credit card. Apple Wallet’s strength lies in its ease of setup and use and security too. The app’s design is simple, intuitive with the TouchID giving the Wallet, an extra layer of security.